A large proportion of the population has been wiped out by a deadly contagion known as Cash Disease and a powerful organisation, The Solution, is established to contain the spread. The Solution has the ability to control dreams and change reality to suit its own ends. When Elizabeth Reznick's mother dies from the disease, The Solution realise they can use Elizabeth to gain absolute power by connecting through her to an energy known as The Ultimate Reality. However, Alex Treaty and his band of renegades - including Elizabeth's first love, Randal Markins - wont stop until The Solution is destroyed. 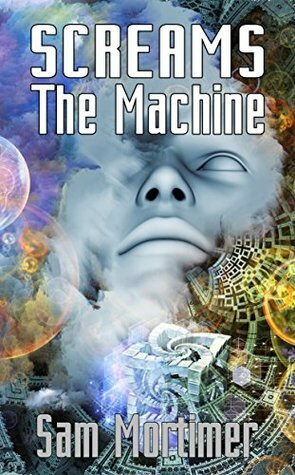 Screams The Machine is a wonderful piece of writing and a welcome change from my usual reads. I'm not a massive science fiction fan but I like to indulge occasionally. I sometimes find the associated 'world building' can be hard-going, but this little novella was a great surprise. I was reminded of George Orwell's 1984 - of being watched and controlled. If thought about long enough, it becomes a very scary prospect. Sam Mortimer's writing flowed with ease and eloquence. The reader is given enough depth to each character without it becoming overdone. I thought the idea of a deadly disease spread through handling cash was ingenious and it left a horrific imprint on my mind. This book is one I'll be thinking about for a long time to come. My thanks to author Sam Mortimer and publicist for providing a copy of this book. Cash carries a disease; one that's already killed a large majority of the population and something needs to be done. To stop the crisis from escalating, The Solution (a worldwide organization) is formed and rises to great power. They monitor people's dreams and shape reality to fit their own wants and needs. In an effort to control existence itself, The Solution is searching for what they believe to be the ultimate tool; a person with the ability to master a deep connection with the mysterious, pervasive energy known only as The Ultimate Reality. The stratagem of The Solution is single minded - own the resources and you own the people. And the last resource available is free will. They will own your thoughts, they will orchestrate your dreams; they will dine on your fears. But there is always a cog in the machine... or in this case, a scream.